What are your top requirements for choosing an auto repair shop? Some might say the company has to be reputable, others would probably mention trust and honesty, and most all of us would include unwavering customer service as a must. World Golf Village residents can find each of these qualities in Feldman Auto Repair, plus so many more. Owner and Master Technician Gary Feldman is dedicated to ensuring each customer leaves completely satisfied with their experience. He is also a World Golf Village resident, having lived in the Isles of the World for two years. We recently got the chance to learn more about Gary and Feldman Auto Repair. Tell us about your professional background. I have been in the auto repair business for 32 years, starting off as a mechanic’s helper and working my way up the ranks to master technician and owner. 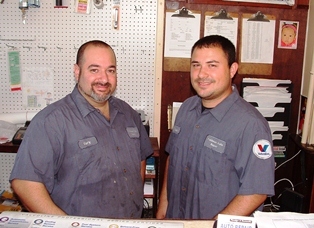 Feldman Auto Repair is family owned and operated. How did the business get its start? After a long, successful run in New York, my family and I had decided on a change of scenery, and after visiting we knew that St Augustine was where we wanted to call home. Earlier this year, my nephew Michael relocated to Turnberry with his fiancé from New York as well, and we became partners. Does Feldman Auto Repair specialize in a specific make or type of vehicle? We consider ourselves a complete auto repair facility. We specialize in both foreign and domestic vehicles. Customers visit us for brakes, suspension, diagnostics, maintenance, tires, and we recently added a state-of-the-art alignment machine. What sets the business apart from other auto repair shops? We value being a local family owned business and what that means to us is that we strive for a sense of community, and most importantly, TRUST. Offering high quality work at a fair price allows us to feel proud of what we do every day and enjoy the work. What do you like best about living in WGV? World Golf Village is a great place to raise a family. There are also a lot of friendly people and beautiful landscapes. Located at 3816 N Ponce de Leon Blvd in St. Augustine, FL, Feldman Auto Repair’s ASE-certified technicians are trained to service both foreign and domestic vehicles. They also provide U-Haul rentals. Interested in a free oil change? Simply “Like” Feldman Auto Repair on their Facebook page, and each week they pick one person to receive a free standard oil change. Additional contests are also coming during holidays! Contact Gary or schedule an appointment via web (www.feldmanautorepair.com) or phone (904-217-0865). Reliable expert repairs. Friendly service. Gary makes every effort to acommodate his customers. He provides extra service even when doing a routine oil change. I highly recommend Feldman Auto Repair for any kind of auto service or repair.